Only a month ago, high school student Kit Lowell, lost her father in a car accident. She’s been trying to put on a brave face, but she just can’t face the inane talk from her two best friends anymore. At lunch she decides to sit next to David Drucker, a smart, nice boy that has always been a little socially awkward. David is unafraid to bring up the subject of her father, and Kit finds his blunt honesty refreshing. Soon Kit and David are eating lunch together every day as their tenuous relationship blossoms. Kit even asks David to help figure out the specific forces of the car accident that led to her father dying. However, when David’s notebook, which is filled with commentary about his fellow students, is stolen and published online and Kit is forced to confront truths about the accident she is not ready for, their budding relationship is challenged. After reading Tell Me Three Things, I was excited to pick up Buxbaum’s newest book. Like Tell Me Three Things, she has created extremely nuanced and interesting characters facing real issues. 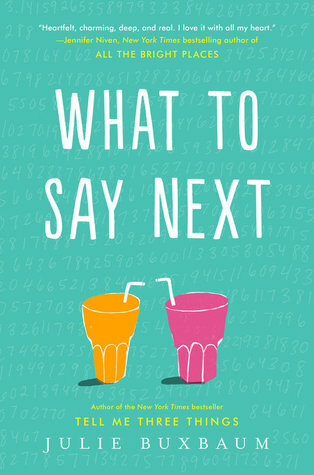 While I think I connected with the characters more in the first book, this is still an interesting book I would recommend for fans of Jenny Han, Sarah Dessen, and Jennifer Niven.